We've got a special one today. I believe the Supernova was, in its time, the most peated whisky in the world. This is the second edition, from 2010. While not as legendary as the first, this is still a very sought-after whisky. But isn’t every Ardbeg release? Let’s try it. Nose: High pitched citrus, chocolate, hazelnut, brine, fish oil, black licorice. All very light, bright, sharp, high-pitched, and astringent (in a good way). Finish: Long and big. Bright, light honey, industrial peat, lavender, chili, earth, parmesan cheese, gentle floral notes, hazelnut, and a somewhat “fermented” note. Thoughts: Crisp and clean. This has many of the typical Ardbeg flavours you’d expect. Still somehow bright and refreshing, despite the power and abv. It’s not as heavy or severe as the Corryvrecken. Of course at 60%, it’s no delicate flower either. There is a certain fermented note / cheesiness which is distinctive. But as much as I want the obscure flavours to shine, it’s the classic Ardbeg profile that I’m most captivated by. The peat here is large and in charge. Very potent, very clear. Certainly there are more complex Ardbegs than this, but few can match this one’s vividness and intensity. Delicious. Thanks for your review, @hunggar. I hope that you were fortunate enough to acquire a bottle of Supernova 2010. It starts great and just gets better and better in the open bottle. Two years open it will be at its best to that point. Fabulous smokey peaty whisky! @victor @hunggar I am glad I have a couple stashed away. I have an open bottle that I've been tasting every month for the last six. It is seriously getting better and better as time goes by. Ah, yes! The old school Ardbegs from the great forgotten era of 2010. Back when peat monsters ruled and the world was getting it's first taste of NAS whiskies. Second in line after the inaugural 2009 release of the same name this one ups the ante with a an extra 1.2% of alcohol. What is an extra 1.2% you ask? Everything! Just ask my stinging taste buds! I remember having this when it first came out and being suitably blown away. I was young and naive, much like this spirit, and easily overwhelmed. Now it takes a touch more to impress. And I have to admit the spirit does it's best! Nose : Reminds me of the Still Young. That same youngish malt with classic Ardbeggian aromas. I know the peat here is cranked up but it still comes across as understated. Sharp lime. Lemon sorbet. Vanilla. Green apples and pears. Honey crust. Sugarcane. Let it breathe and it becomes more sooty. But with an underlying sweetness to it. Now with more herbs. Some cardamom. An essay in balance. Palate : Lots of black and white peppers. Prickly green chilies. Lemon. Sugarcane. Dry honey. Slightly bitter oak. Melon. Mint leaves. Quite savory belying the nose. Fires up the tastebuds that's for sure! Made me salivate. But the spices dominate. Is the high strength trying to mask something? Seems like it. Finish : Oily. Tobacco leaves. Limestone. The same spices. Touch of smoke. This is a fine dram. Need to sit with it for a while as it evolves. As of this writing I have not had the 2009 version which I've heard is off-the-hook. I'd love to make a comparison. Overall great nose and finish with the palate marginally behind. @MaltActivist, thanks for a nice review of a great favourite of mine. One of the most interesting things about Ardbeg Supernova 2010 is that, even though it starts out great, it just gets better as the bottle sits open for the next 2 years time. I might have rated my bottle 92 at first, and then 95 or 96 two years later. @Victor thanks for stopping by. Good to know this one's going to become better with age. I think I'll decant some in a sample bottle and compare it over the next couple of years. At a glance: Very pale in colour, appears weighty and oily. Nose: As many reviewers have noted, the first thing that strikes you isn't really the expected peat explosion, but the lack of this very explosion. The peat is definitely there (phwoar! ), but it's very well integrated - it feels round and creamy amidst notes of earth, black pepper, coffee beans, tobacco and apple. Sooty citrus soon announces its arrival and is soon followed by sweeter barbecue notes and a smoky salty sensation (think salted, smoked sausage - or Lagavulin). More marine allusions like tar and seaweed appear in the tail end. It's a very inviting nose, almost along the lines of Ardbeg 10, but with more sass and moxy. With water: Chlorine and more peppery notes appear. Palate: First a sip at the full 60.1 % (!) For the first second you're fooled into thinking it's a very mild and oily dram, but you're in for a surprise.... In the mouth it quickly becomes very dry, as it starts to nudge you with playful embers. These embers soon burst into fire, and it burns, burns, burns - not the alcohol burn you'll get from many whiskies; more like chili peppers set aflame. As soon as the fire starts to fade away, it becomes creamy (here I'm thinking of the 'ice cream' sensation found eg. in Airigh Nam Beist) and sooty, whilst shy fruity tones of apple and elderflower come into place. Meanwhile, the embers move to the stomach (it'll warm you throughout the night) and the taste becomes very hospitable indeed. Palate with water: The beastliness is toned down quite a bit, and it falls sort of flat. The finish becomes creamier, however. Drink this neat - it'll put hair on your chest (and sear them off again). Finish: One of my favourite things about peated whiskies is the charcoal and soot that you'll taste in many of them - and here these very things linger on and on with bitter coffee in the background. Back beauty, keep it, beauty, beauty, beauty, … from vanishing away?" And indeed: here it is. If you have the money. I'm not a big fan of giving whiskies scores, but 95 sounds about right. The 2009 version is still unopened on the shelf, and now it'll be difficult not to open that... Beautiful. Thanks for breaking out of "luking" mode. It took me a while also. Love the review. And I agree with @Victor - this one only gets better open. That said, I LOVE the 2009 Supernova even more (like one of my top malts ever). Only, it seems to lose some of its magic after time (once it hits the half way mark in the bottle the clock is running). I think I had my bottle open for three years. It was still good at the end, just not great and magical. ALL that to say . . . let me know if you need help drinking it. Ardbeg Supernova 2010 is fantastic whisky, all right. Delighted to see another fan of it...thanks for a nice detailed review. The best news of all: that Supernova 2010 will get better and better for a good 2 plus years that it is open...my experience, and also @Nock's experience. Supernova 2010 is often looked upon as Supernova Light, a bit of a very expensive and scarce stepchild. This bottle was purchased after my then-heavy-peat-averse wife had tasted a sample of it and suggested that we buy a bottle. I jumped at the chance which marked for the first time the acceptance of heavy peat by my closest whisky partner. A lot of discussion about Ardbeg special releases centers around price. Are they expensive? Usually. Worth it? Maybe. For me this one is a fabulous whisky, which actually tastes better 2 years after the bottle was opened than it did on day 1, or day 31. That sort of flavour evolution is NOT factored into any review done when the bottle first comes out. Palate: extremely lush peat, with the smoke still vivid 2 years later; there are layers to explore if you take the time. The attraction of this is in the quality, lushness, and variety of the peat experience. Strictly as a peat experience, I prefer this one to both Uigeadail and Corryvreckan. Finish: just burns a good-tasting hole on your tongue...all that peat and smoke; delicious. Very long finish; everything holds up. As for me, this is my favourite Ardbeg in my collection, along with my favourite batch (only) of L10 151 Uigeadail. Hope you like it! I really hope Ardbeg isn't done with this style of heavy peating. My strong opinion 1) This was great as-is: keep it coming 2) It would also be wonderful as an older malt (15-21 years old). @CognacFan, I am looking forward to tasting with you again. You are a true artist in the medium of chocolate! Ardbeg Supernova was first released in 2009, sporting an ABV of 58.9% and an impressive phenol level of 101ppm. This second edition was launched on 31 May 2010 at an even higher ABV of 60.1% and with the same 101ppm. Ardbeg Supernova 2010 was matured primarily in ex-Bourbon casks for about nine years. The nose yields salt, brine, smoked bacon, soft and mild smoke as well as some coffee. With water there are lemons and vanilla, along with some grassy notes. The palate is full-bodied and massive, there is an almost explosive rush of smoke, powerful and very spicy. With water the palate becomes more rounded and astonishingly sweet with hints of orange and lemon, yet it loses nothing of its intensity. The finish is long and warming. I again detected smoked bacon , some chili and a hint of vanilla. All in all this is a very powerful ending! This is a very, very impressive malt. It is not what I would drink every day and it took me more than a year to finish my bottle but I relished every second that I spent together with this baby! Interestingly enough the peat on the nose is rather soft and sweet, at any rate much less pronounced than I had expected it to be given the high phenol level. You could call this a restrained peat monster - I loved it! In 2009 no less than 21.000 bottles of the Supernova were released. It was an 8 year old Ardbeg from bourbon casks at cask strength. It sold like hot cakes, especially after the 3.000 bottles of the Committee Release (2.400 for Europe, 600 for the States) were sold out in a matter of hours in January of the same year. With its 100ppm, this is the most heavy peated Ardbeg around. A 2010 release was written in de stars. The ABV is even slightly higher. On the nose, I get a weird kind of sweetness at first, one that I would not associate with Ardbeg. 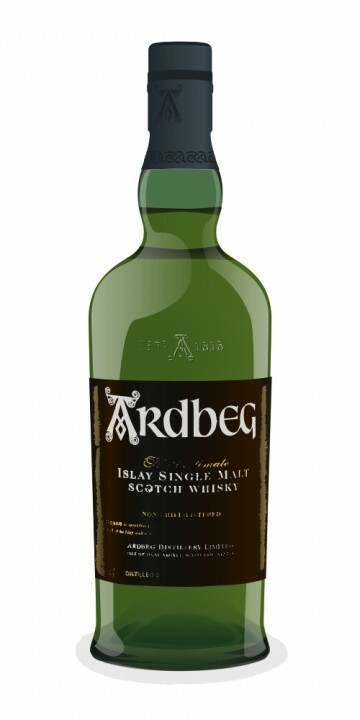 Yep, there is peat, but the most heavily peated Ardbeg? Could have fooled me! The lime and apples are present, sure, but toffee, caramel and even roses appear. Smoky, with tar, tobacco, cod oil and wet grass. Exceptional. That is the least you can say of this Supernova. After some hand warmth, it shows a salty side with some mercurochrome and soot. But it has a young streak, almost like new make. And I really like it. Adding water brings out more soot, yet also sweetens it further. It is very grassy on the palate and now shows the true force of the phenols. Yep, this is very powerful indeed. White and black pepper, liquorice, eucalyptus, aniseed, allspice. The citrus is now almost a concentrated syrup. Halfway through, a truckload of salt is added. Zesty and sweet, slowly turning bitter as in grapefruit. Wow, I am really fond of this! Adding water makes it sweeter, mainly on vanilla. The finish is very peppery, but wonderfully sweet. Obviously, a supernova is a dying star, but for me this is a star born in the cask. What an Ardbeg, so different. I am going to get me a bottle of this. Around 100 EUR. Nose: Spirity fire, ash, burnt earth, liquid tar, huge peat and smoke, saltiness, a little overwhelming, some coffee notes, peppercorns, red chillies. Palate: spirity hit, chilli and peppery like, huge peatyness, camp smoke, some very strong expresso, sea saltyness. Finish: Peat and smoke eventually taper out, some sweetness from notes of expresso, slight vinilla, cocoa powder. Huge whisky, you can actually distinctly taste peat hours later. I Love this whisky, especially because of it's size of the punch on the palate but of course you have to love peat. Served neat, cut and uncut. Luckily had this at a tasting and didn't need to blow $135 on a bottle. Pour: Very clear white grape juice color...chardonnay like other Ardbegs. A thick rings sticks to the side with a swirl generating slow tears. Nose: Musty atiic, sharp honey, mild salty bacon, old/crumbling smolder and fireplace, with spicy coconut curry. Cut, the nose explodes with heavy ocean brine and salty meat/jerky. Taste: Lots of heat in the back, spicy oak, coconut curry, amaretto, floral spices. Cut, the taste gets a little muddy and I'm not sure if it was smart to try this with water. Would like to try this again, but for now I like the Uigeadail better but neither of those come close to Corryvreckan. Still, I would love to get this a few more tries as long as I'm not the one footing the bill. When I first taste this one it is very salty and sweet. It is real smooth. But the finish is very peaty and smoky. For me the finish is a bit to hard. That's why it rates 80 and not 90. Nose: Oh mama. Peat smoke in kilos. Alcohol is felt ok. I let it rest quite a bit in the glass before sniffing again. Under all those layers of peat you can find lemon zestiness, apples (green) some hints of vanilla and burnt sugar.Also Rubber, Tar and some wet gauche paint and petrol. Freshly laid PVC in a gym hall . Throws me back quite a while to a time when i was a kid playing basketball in our new PVC laid gym. Palate : Wham! it's like a hammer on your palate. Strong stuff, big flavours. starting with the sweeter burnt sugar and maltiness then dark chocolate and double , i take it back, quadruple espresso.Tar all over, smoke in Kilos and peat all over the place. Some pepper as well, as well as chilli and soot. damn spicy on the tongue. Finish : Bitter espresso,pepper and smoke fills your mouth for minutes. Tar. This one literally lasts minutes in your mouth. hours, days. man! this is an endless finish, like it or not. It’s something. This one is definitely not your daily dram. it's biting, very very tough and needs a lot of water in order to be tamed. Today is a very hot summer day when i am tasting it in the comfort of my A/C, but it's a classic for a windy, thunderstorm night. So, do i like it? Yes i do, but do i like it enough to be getting a bottle of this? Probably not. I guess some of you think i am out of my mind, a peat freak like me, not in need of this peaty monster? Well, it’s not very cheap, and I think i do prefer Octomore 2.2 over this one. I can’t put my finger on it, this is not a bad dram, it’s actually very good, but should this be the 2011 whisky of the year (In J.Murray’s bible) ? I think not. Chances that it will, but that’s a different story. If i had to choose a peat monster to be on my shelf, I’d go either with the PC8 or the Octomore 2.2 ( I hear Octomore 3.0 is coming out really soon, and can’t wait to have my way with it ). Nose: it shares the same elements as the 2009 edition: oily peat, pepper, tobacco and a touch of citrus and apple. There are bigger notes of graphite and phenols / gouache paint in the 2009 edition. On the other hand Supernova 2010 seems to boast more sweet apple and camomile (some call it soapy because of this, but I don’t really mind). I would say 2009 is rougher and 2010 is smoother and better balanced. Mouth: very earthy and grassy now, with wet hay. Slightly less peaty than the 2009, or so it seems. Very bitter coffee. Some salty notes. Liquorice. Lemon zest. A bit of menthol and anise towards the end. A bit sharp and bitter maybe. Finish: hot and quite sharp. Liquorice and dry pepper. Even though this review sounds more positive than mine, I agree with it for the most part! I only think that the Rollercoaster is better, and it still has the salt and the licorice. I haven't tasted Gouache paint in a while (not since I studied art, oooh, 12 years ago) but I know exactly what you mean! To sum it up, the 2010 version is a complete and utter sellout, if you ask me. I'm quite shocked by the low score this bottle has recieved on here (2 out of 3 scoring 7.5 or less). I sampled this last weekend as part of a little Ardbeg tasting session i had. I tried the 2010 Supernova, Uigeadail and my standard 10yo. And i was blown away by the SN2010. I was secretly hoping to prefer the Uigeadail as i planned to buy a bottle of either the Uigeadail or the Supernova depending on which i prefered. And the Supernova is obviously the more expensive one. Oh well. This whisky is really dividing opinion - must get my hands on some and add my tuppence worth! "Ardbeg Supernova is significantly different to the first bottling but an absolute stunner all the same. It’s a train track whisky, with one rail massively peated, peppery and hot, and the other fudge-like, soft and with banana toffee notes. At a hefty 60.1% ABV it warrants sipping without water but explodes in to a complex oral rainbow with a touch of water. Quite wonderful." Tony bought a bottle at the festival, he says "hmmm, peaty and very strong, my favorite. I have to say though, at £82 its very expensive, damn you collectors!" OK, so Jim Murray gave the predecessor of this whisky a great score. But that to me is no reason to redo the committee bottling this once was. A complete sellout.... I just wish they had come up with something new instead, and left the original Supernova alone.